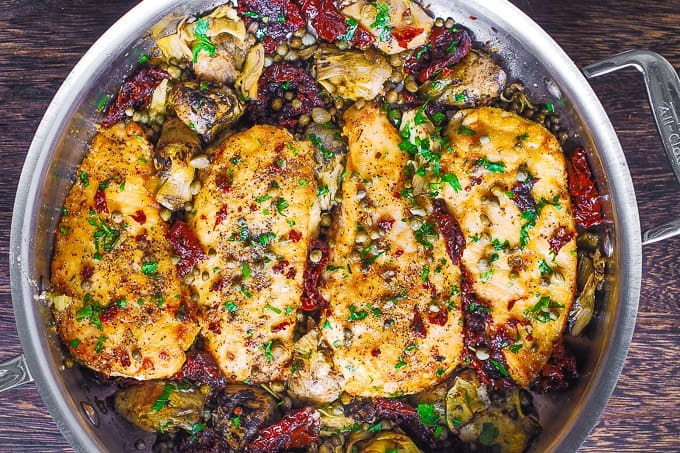 Mediterranean Chicken with Sun-Dried Tomatoes, Artichokes, and Capers – a one skillet recipe. Easy to make, 30 minutes from start to finish! You’ll love the play of flavors in this dish. One of the main reasons I love Mediterranean cuisine is, of course, my passion for pasta, but in this case it’s not about pasta. It’s all about the chicken. With lots of vegetables and olive oil. In this recipe, I use thinly sliced boneless and skinless chicken breasts. 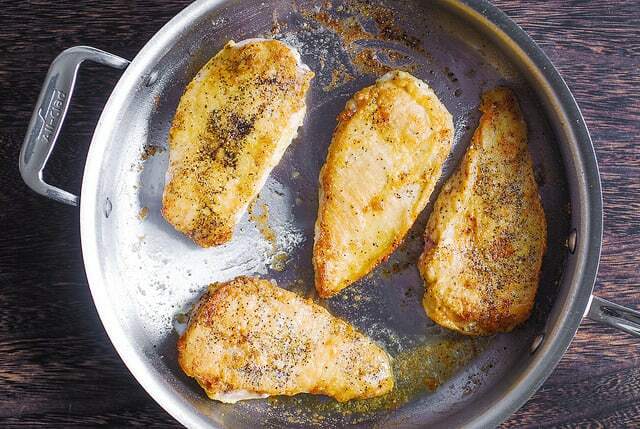 If you have large chicken breasts, you can slice each one of them lengthwise in half to make them thinner. I used roasted artichoke hearts in olive oil. I also used sun-dried tomatoes in olive oil, too. In this case, I didn’t even drain them to get rid of excess oil, because the more olive oil in this recipe, the better. If you use artichokes and sun-dried tomatoes that are not in a jar with olive oil, definitely add extra olive oil, if you wish. 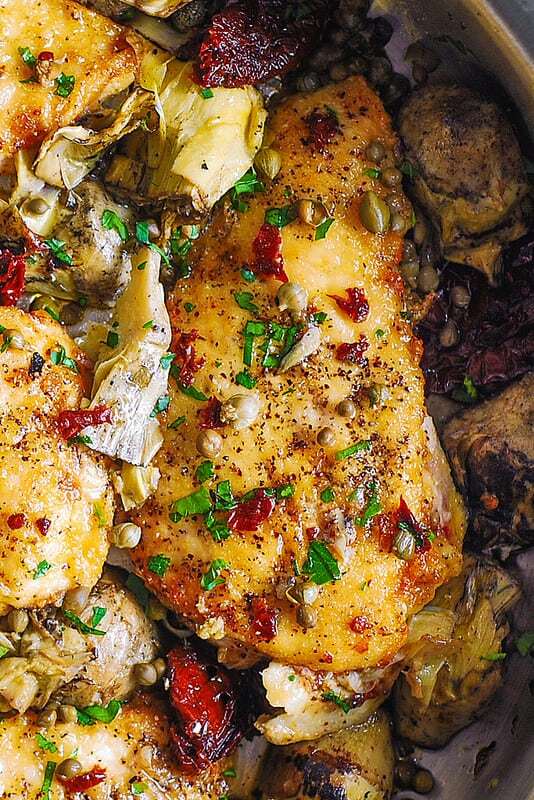 It’s always a challenge not to overcook chicken breasts, and in this Mediterranean-style recipe your chicken will be moist, tender, and very flavorful! 1) First, season the chicken with salt and pepper and coat with flour. 2) Next, sear the chicken in olive oil for about 4 minutes on each side. 3) Then, remove the chicken from the skillet. 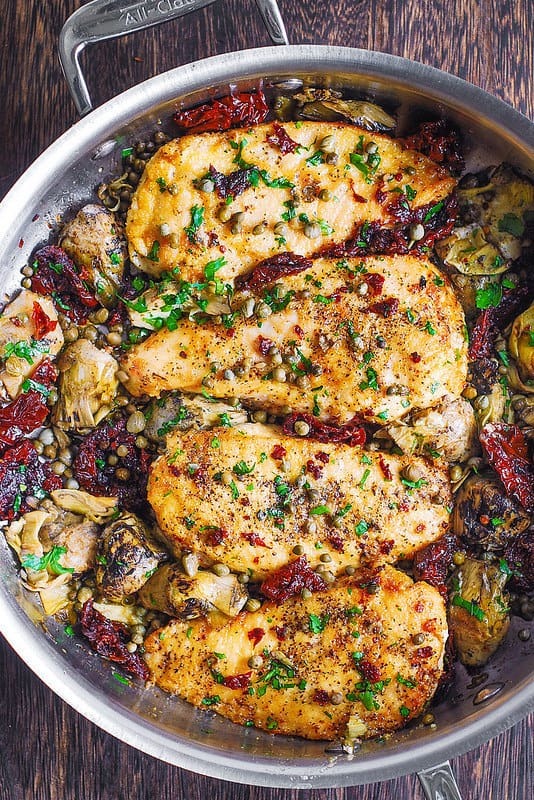 Add the sun-dried tomatoes, artichokes, and capers with lemon juice and extra olive oil to the skillet and stir together. 4) Add the chicken back and cook for about 5-10 more minutes until the chicken is completely cooked through and no longer pink in the center. Your Mediterranean chicken is ready! Yes, in 30 minutes! Easy, no fuss dinner that tastes good and looks good. I used gluten free flour for coating the chicken which makes this recipe gluten free! 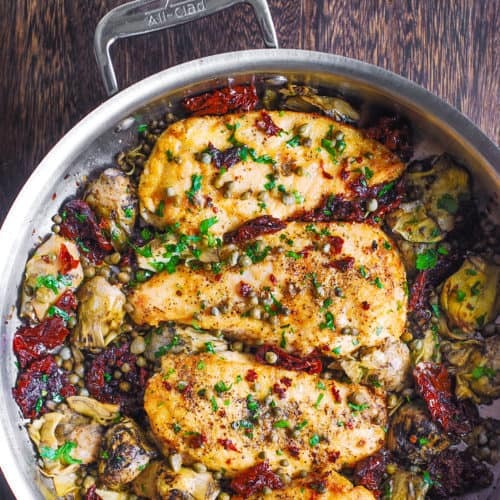 Delicious Skillet Chicken with Sun-Dried Tomatoes, Artichokes, and Capers. 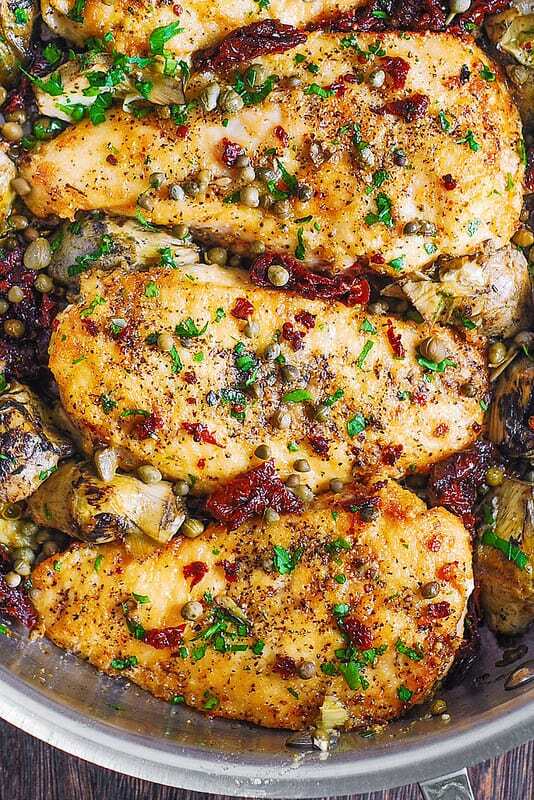 If you love Mediterranean recipes, this chicken dish is for you! Season chicken with salt and pepper. On a large plate, dredge chicken in flour. Heat 2 tablespoons of olive oil in a large skillet on medium-high heat. Add chicken and brown for about 4 minutes until it turns nice golden color. Flip the chicken over to the other side and brown the other side for about 4 minutes on medium heat. Remove the chicken to the plate. 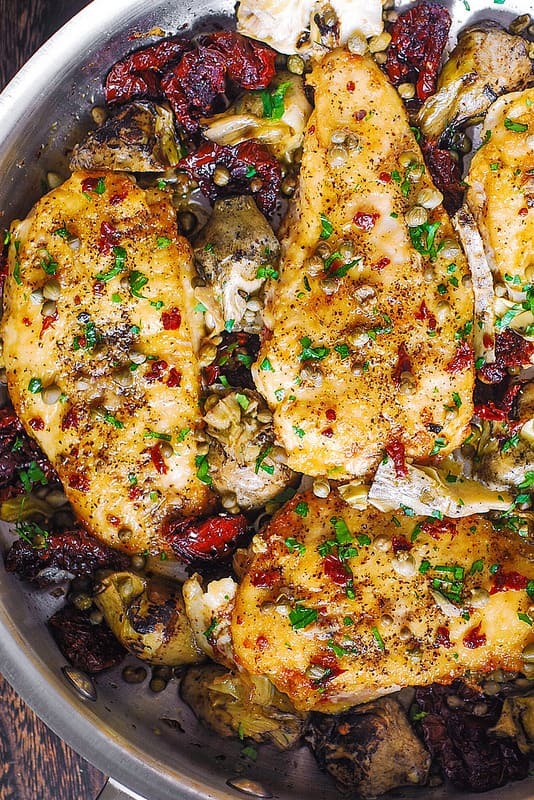 Add artichokes, sun-dried tomatoes, capers, and lemon juice to the same skillet. Stir to combine, on medium heat. Reduce heat to medium-low. Add 2 or 3 tablespoons olive oil, stir in to combine. Push the vegetables to the sides of the skillet, and add the chicken back. Cook the chicken and the vegetables on low-medium heat for about 5-10 more minutes, covered, until the chicken is completely cooked through and no longer pink in the center. Depending on your stove, you might have to cook either on medium or on medium-low heat to cook the chicken through. Serve immediately. Make sure to spoon the olive oil mixture of vegetables from the skillet over the chicken. This recipe is fabulous! The flavors are incredible. We are a family of 3. I made this using 9 thin cut breast’s and only had to put away 2 pieces! Served with Greek mashed potatoes and a traditional Greek salad. Perfect meal! Thank you for sharing this recipe. It was very easy to prepare and my family really liked it. I think you can definitely make this a day or two in advance, and keep it refrigerated in airtight container. Just make sure not to overcook the chicken so that it’s not dry when you reheat it. Reheat gently on low-medium heat in a skillet on stove top, add extra olive oil, if needed. Just made this recipe it looks and smells delicious. I added red roasted bell peppers that I marinated in olive oil and garlic as they were already in the fridge needing to be eaten. I will definitely save this recipe. I made this today and used almond flour to keep it keto. It was really good. But what is the green in your recipe? I am glad you liked it! And good to know it worked with almond flour. I think it was chopped fresh parsley that I sprinkled over the chicken. This looks delicious! I am going to try this recipe tonight. Being that I follow a Keto lifestyle, I am going to replace the flour for some almond or coconut flour instead. Will serve it with a nice greek salad or some green beans. Will update to let you know how the flour substitution worked out. What a great idea to use almond or coconut flour! It should work well! Enjoy the recipe! I am new to Pin, just started using it about 3 months ago. Yet your recipes keep coming up and everything from your saves, that I have made taste so good. Very easy, adaptable to tweak to personal taste, or food choices. So now if I am looking for something I check for your name first. What wanted you to know how much I enjoyed your site. Making the Mediterranean chicken tonight. Thanks. Thank you for your kind words! I am so glad you found my recipes useful and easy! Thank you so much for leaving such a wonderful comment. It really makes my day to read comments like yours! Thank you for a great recipe. What amazing flavors! On my husbands elimination diet Mediterranean seasonings are a good option as many other recipes incorporate garlic, ginger etc. This was easy to follow, I used artichokes canned in water and sun dried tomatoes in olive oil and found that one more TBSP of oil was adequate for us. Added just a tad of red onion and topped it off with some crumbled Feta cheese.